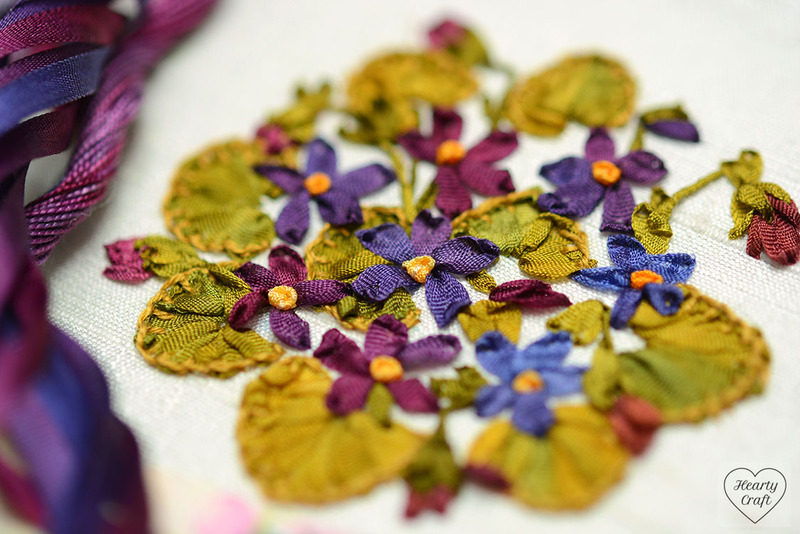 One more flower is finished and that means only four left to complete Garden Party silk ribbon embroidery designed by well-know Australian designer Helen Ericsson. 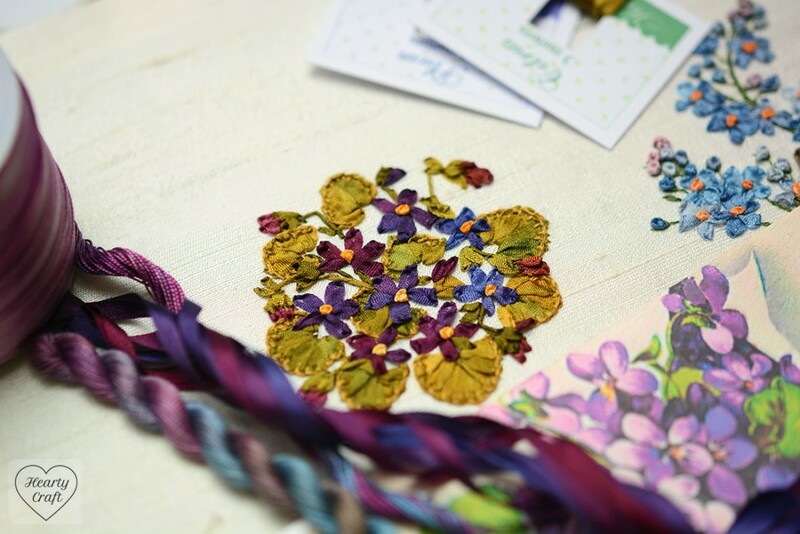 If you missed my previous posts about the piece, here they are: forget-me-knot, wisteria, foxgloves, and rose (click to find out more about each stitched flower). So today it’s time for gorgeous violets to be shared. There were two attempts to stitch the violets, I must admit. When I just started to work on The Garden Party the violets were the first flower I started stitching. Unfortunately for me I made a foolish mistake to pick out solid silk ribbons instead of spaced dyed ones recommended in a supply list, and the piece ended up in a box with other unfinished embroideries quite shortly after it was started. It had spent there almost three years before I eventually got inspired to give it another go this time using hand-dyed silk ribbons. I don’t mind stitching with solid silk ribbons at all, but for some designs they just don’t work, this one being perfect example. Solid violets looked quite flat and dull, and just one variegated purple ribbon has changed visual perception of the embroidery tremendously. I love the outcome. The violets are beautiful. As usual Helen Ericsson pays tremendous attention to details in her designs. 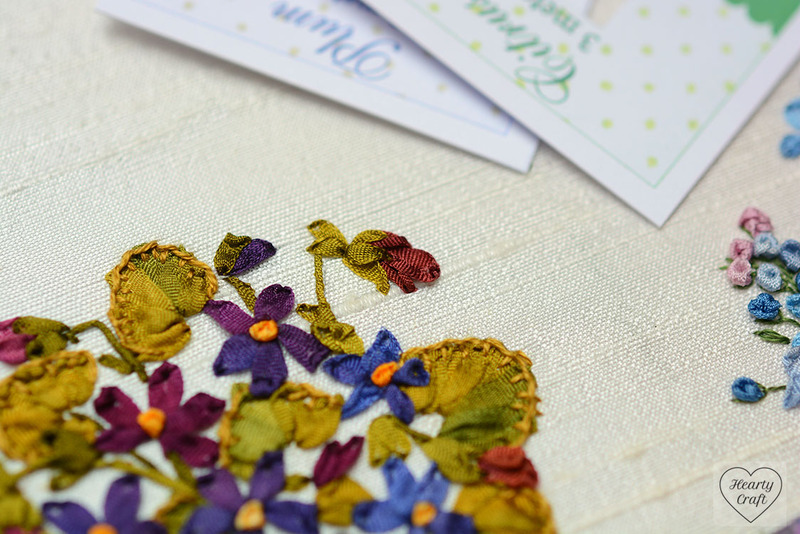 The buds are delicate and pretty, and I really enjoyed stitching lovely leaves. This entry was posted in Blog Posts and tagged Inspiration, Silk ribbon embroidery on 16th July 2015 by Zinaida.